January 1950. The WETU met Jan. 17, 1950 with Ms. Whilely. Airing to the illness of the scheduled devotional leader, Mr.s Ed Adams, the devotions were concluded by Ada Parks. There were drills by the President. Mrs. McBlain says we should write to Attorney General Harpon. The program leader, Mrs. Willis Twigle, talked about the Langer Bill S-1847, against liquor advertisement. Our attention was called to the information on how to write to Bentars and Representatives as given in the December 1949 Union Signal page 4. Mrs. Allen talked about Parliamentary practices. The secretary's report was read, corrected and approved. Mrs. Bartore says Sam Morris asked us for money. Mr.s Bartore paid 5 women in the church $1.00 each. Mrs. Me Balin again urged "send dollar" people. Our $2.65 per year pays for other magigmes, and the rest for probational work. Mrs. Allen reported on the LJL. Seven received medals. The reviewed a law. Mrs. Wright, one of our members, has a projector. Can we obtain a film? Mrs. Allen said some few people came to the contest. Mrs. McBalin asked us to pray for her, as she should go next day in the interest of a negress, Mrs. Kiner, at Evart. 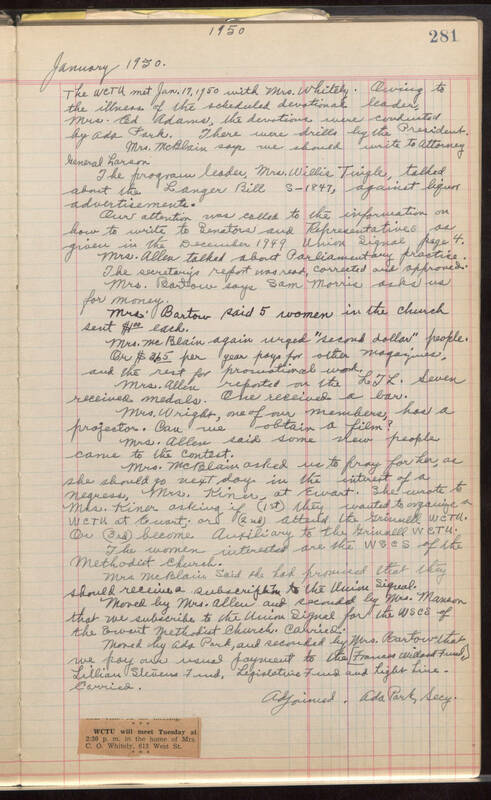 She wrote to Mrs. Kiner asking if (1st) they wanted to organize a WCTU at Ewart, or (2nd) attached the General WCTU. Or (3rd) become Auxiliary to the General WCTU. The women interested are the WSCS of the Methodist Church. Mrs. McBlain said the had promised that they should receive a subserighon to the Union Signal. Moved by Mrs. Allen and secede by Mrs. Maneorn the Evant Methodist Church. Carried. Moved by Ada Park, and recorded by Mrs. Bartow that we kay our usual payment to the [Frances Willard Fuel] Lillian Sleveus 7 used, Legislator 7 used and higher Lire- Carried. Adjourned, Ada Park Secy. Attached Article WCTU will meet Tuesday at 2:30 p.m. in the home of Mrs. C.O. Whitely 613 West St.